"Ukraine refuses to implement some bilateral agreements." Polish Foreign Minister Witold Vaschikovsky notes a level of regress in relations between Ukraine and Poland. "Ukraine refuses to implement some bilateral agreements. After few years since the start of the Polish-Ukrainian dialogue there is no progress in the relations, rather, there is some regress," the Polish minister said on Polish Radio on Tuesday, 21 November. Despite this, Waszczykowski assured that Poland will further welcome and support the pro-European aspirations of Ukraine, and stand against the Russian annexation of Crimea. 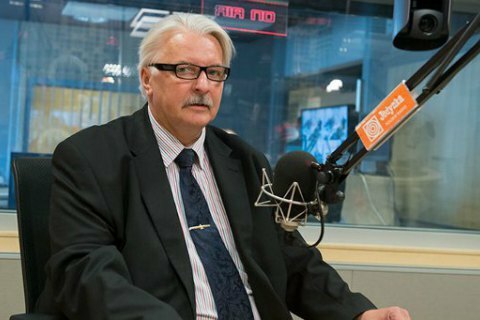 According to Waszczykowski, the ball is in Ukraine's court, and the restoration of the dialogue and return to the implementation of earlier agreements, in particular, on the field search and exhumation of Polish graves in Ukraine, depends on the Ukrainian side. The ban on the entry of certain Ukrainian citizens to Poland is a symmetrical measure taken in response to anti-Polish steps by Ukrainian authorities, the Polish foreign minister noted. The relationship between Ukraine and Poland deteriorated because of the different interpretation of historical issues. On 18 November, the executive secretary of the State Interdepartmental Commission for Perpetuating the Memory of Participants of the Antiterrorist Operation, victims of war and political repressions, Svyatoslav Sheremet, was not allowed to enter Poland. There are reasons to believe head of the Institute of National Remembrance Volodymyr Vyatrovych is also on Poland's blacklist. Poland, in particular, objected the moratorium on the exhumation of Polish graves in Ukraine, which was initiated by the Institute of National Remembrance in late April, in response to the dismantling of an UPA monument in eastern Poland. On 17 November, Ukraine and Poland discussed controversial issues at an emergency meeting of the Consultative Committee of Presidents. A preliminary agreement was reached on lifting the moratorium on exhumation work in the burial places of the Poles.